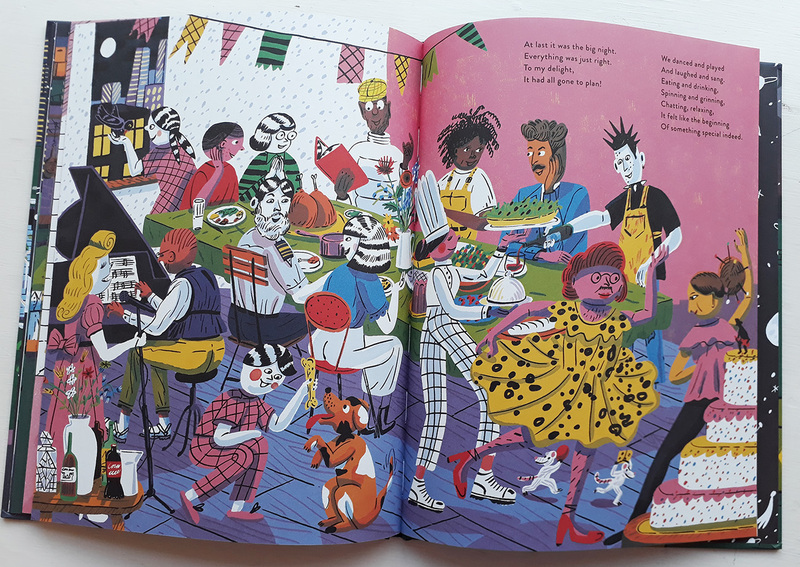 The first word that springs to mind when pouring over Aart-Jan Venema’s illustrations is ‘bustling’. Every scene he paints in Night Windows is alive with an atmosphere of movement and visual noise, a feeling which is encouraged by a richness of detail that will tug eyes of any age this way and that, as they constantly find new things to delight over. 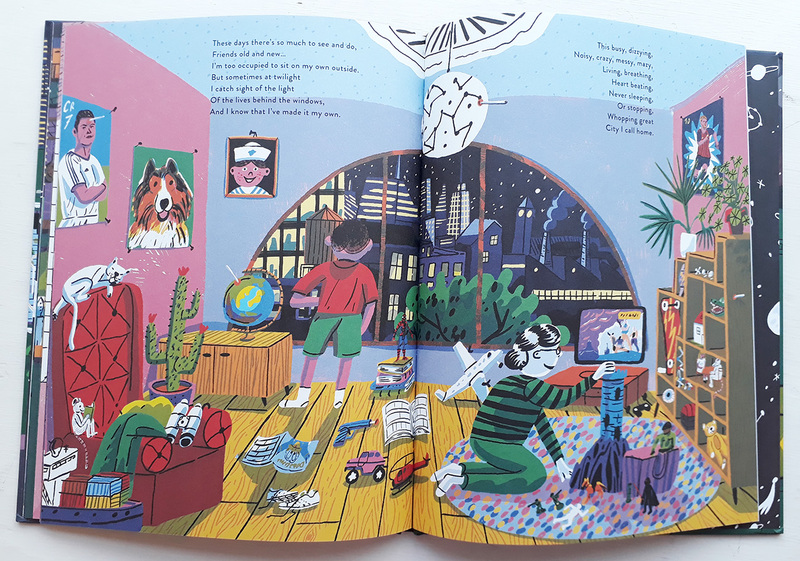 The story is one of a young boy feeling overwhelmed and alienated by life in a strange new city, and the hurried viewing pace that is provoked by such lively illustrations will place the reader somewhere in a gentler version of that hectic head space. Despite their undeniable busy-ness, the pages never feel over-cluttered. Every tiny narrative clue is placed carefully so we can find it, and each one adds a little extra depth to the many colourful characters we meet through the eyes of our storyteller. The drawing style is vibrant and playful, and there is an animated quality to to everything – from a bamboozled sewing machine to the knowing expressions on the faces of two marble busts that appear decidedly more at home and at ease than their human co-habitant. 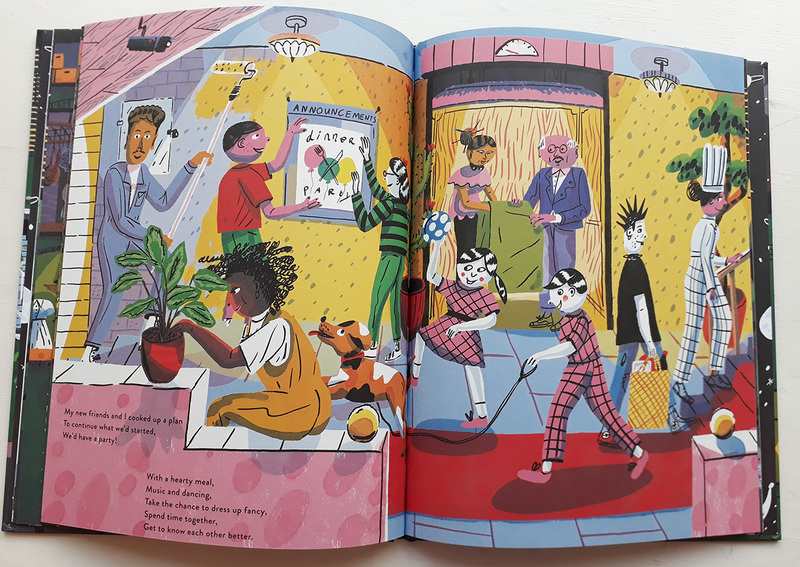 The child’s perspective, the use of rhyme, and the spot-the-little-details narrative style would suggest that this book’s message is aimed solely at younger readers. 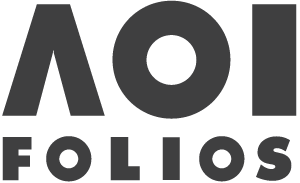 In actual fact, all of these qualities are delivered in a way that gives the book a far richer urban cultural and social texture than might first be observed. The written flow of Ziggy Hanaor’s rhymes are more reminiscent of a rap lyric than a nursery story, and there are subtle nods to certain social dynamics that will only be noticed by an older audience. When one of the boy’s neighbours asks if he can count all six hats in the scene, the child replies: “Seven, there’s one on your head.” This is an enjoyable moment that will engage children in playful counting and observation, but it also exemplifies that effortless ability found in every child: to see so plainly what adults have made themselves blind to. 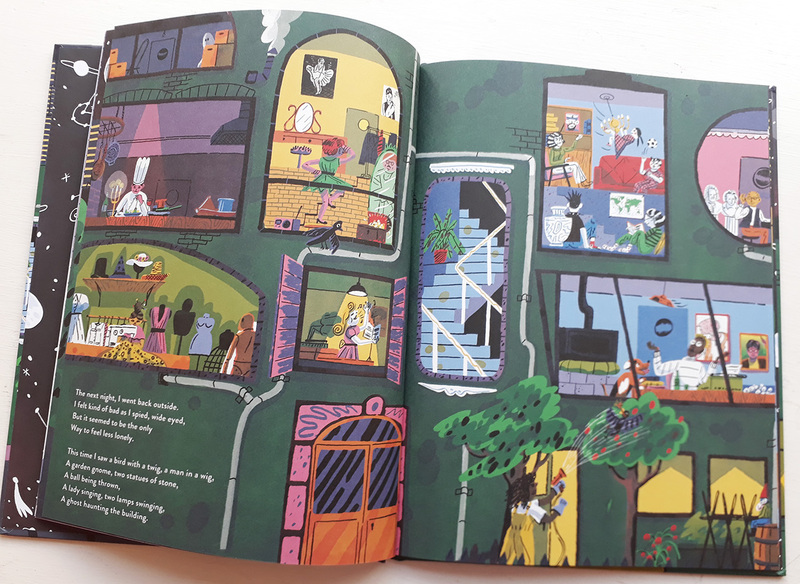 This neighbour revels in observing his world and its inhabitants, but he is so preoccupied with outward observation that he forgets his own equally important place in that same world, and the things he shares in common with his fellow humans. 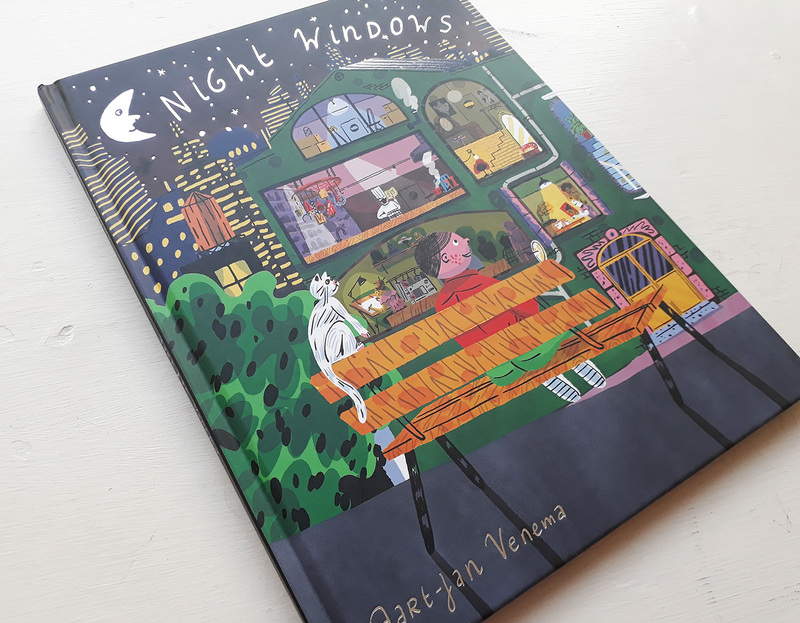 In this moment, Night Windows touches on issues of mindfulness and inclusivity – an important social theme for children and adults alike – and Venema’s thriving illustrations prove a thoroughly engaging and enjoyable classroom for such a lesson.